Along with the new iOS 7 beta 4 and iTunes 11 releases, Apple has also seeded version 5.4 of its Apple TV software to developers. The third beta of the Apple TV software includes (via Schimanke.com) a function that allows users to purchase music from the iTunes store, a feature that was removed from earlier versions of the Apple TV software. 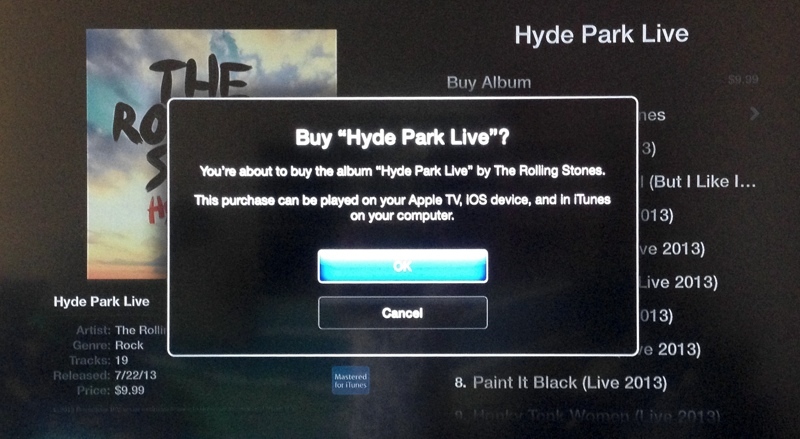 iTunes Music purchases can be made from the Music icon on the home screen of the Apple TV, which offers an iTunes Store-style interface. 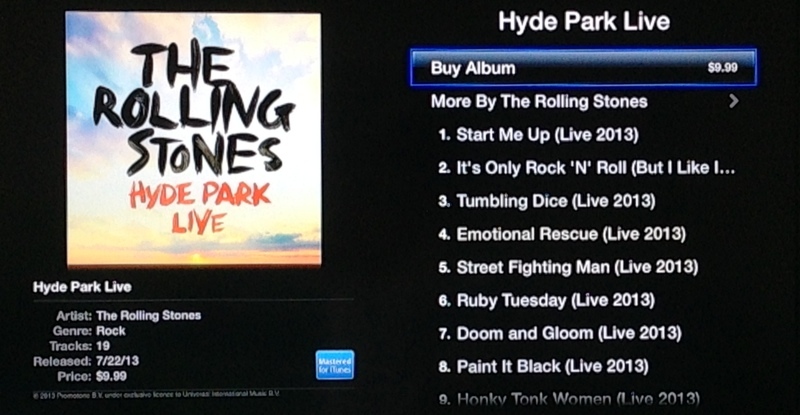 Both individual songs and entire albums can be purchased and listened to using the new function on the Apple TV. The feature, along with iTunes Radio and a "Conference Room Mode" designed for business and academic settings, will be available for public use in the fall. As noted in our post detailing the smaller changes in iOS 7, the Apple TV can also now be set up with an iPhone or an iPad running iOS 7. The updated Apple TV software is expected to be available alongside iOS 7 later this year. Meh, I'm Chromecasting almost 15000 songs for $35 though Google Music with all my Android devices and Macs. That must sound like a jumbled mess! All I really want for my Apple TV... is a VLC app. That's all it really needs..
What I would like to see is "Songs in this show/Movie." You hear a song you like and can hold down the center button (same one to bring up the subtitles) and a list of movie scores come up! What build number is this? There is an installation guide on the Developer Site that tells you how to install it on your Apple TV. multimedia and browsing, it's endless. Oh, how I wish for a jailbreak of the Apple TV 3: And using VNC remote access to my Macbook. OMG can somebody please tell me what freaking build number is 5.4 beta already... Damn! I've asked twice already.